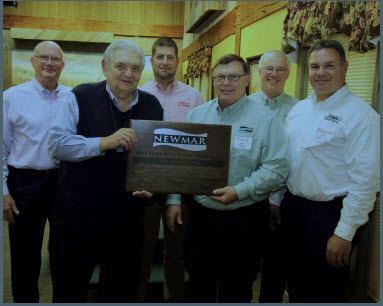 Newmar Corporation hosted an elite group of its suppliers for a sit down dinner at its annual Vendor Appreciation Dinner during the evening of October 29th at Das Dutchman Essenhaus in Middlebury, IN. Approximately 225 people attended the event, at which select vendors were honored in various categories for outstanding performance in supplying Newmar with various components and material used in production of high quality motor home products. The companies recognized for outstanding performance based on internal surveys measuring each suppliers’ level of quality and service while interacting with Newmar’s purchasing, manufacturing and engineering departments. A score of 214 of 220 possible points were required for the vendors to earn an invitation to the evening’s festivities. Established in 1968, Newmar is an innovator and leader in the RV manufacturing industry and recognized nationally for its excellence in quality. Newmar is privately owned and has a dealer network that spans across the United States and Canada. Newmar is located at 355 N. Delaware Street, Nappanee, Indiana. Newmar: When You Know The Difference.